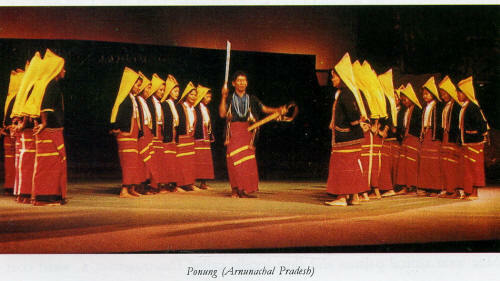 Ponung is the harvest dance performed by the Adi tribal community of Arunachal Pradesh. It is danced at the festival held just before the harvesting operations. It is believed that the dance will bring about a good harvest and prosperity to the community. Married girls and women take part in the dance which is led by a man called Miri. He is adept in singing the particular songs that tell of local myth of the origin of paddy and other crops. While singing the Miri rhythmically rattles the iron disc fitted loosely to the hilt of his sword. The dancers in chorus repeat the lines sung by the Miri. No other musical instrument is used in this dance.